Happy Earth Day! Get ManyCam with up to 35% OFF today.GET OFFER NOW! Create exciting videos while adding fun using ManyCam’s simple and intuitive features. More than 80 Million Downloads! The fastest and easiest to use ManyCam version yet! 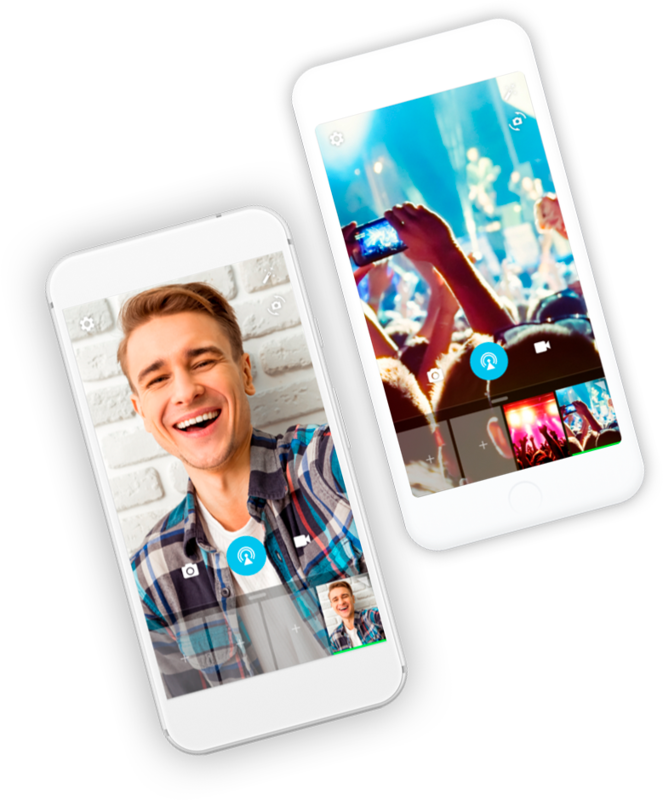 ManyCam is a free webcam software and video switcher that allows you to enhance your video chats and create amazing live streams on multiple platforms at the same time. 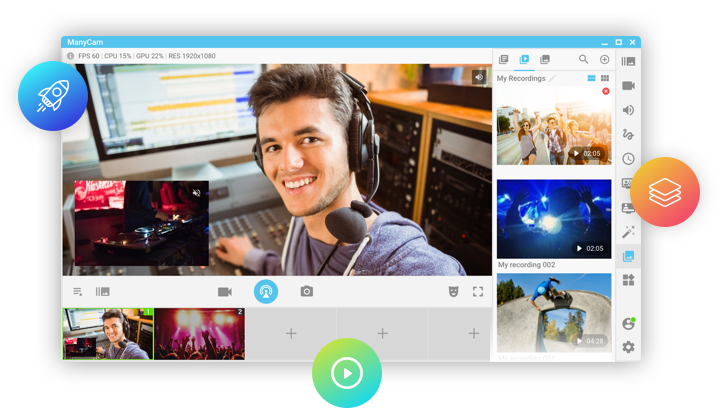 With ManyCam, you’ll be able to create professional-looking broadcasts on your favorite platforms, record your screen, add many effects and much more. Grow your business with professional-looking, yet simple, live video. 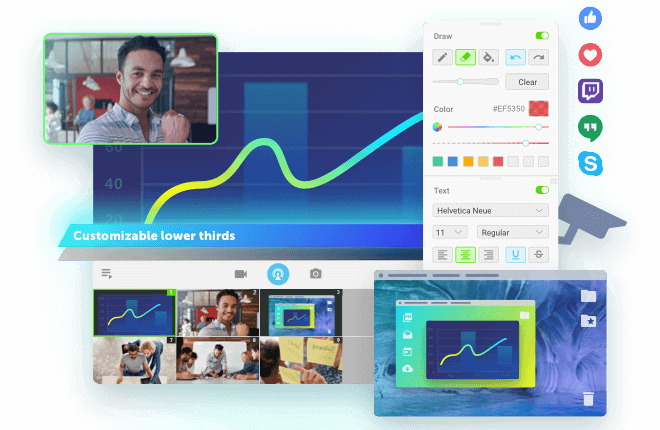 Make dynamic web conferences, improve video calls and create amazing live streaming videos with Picture-in-Picture, multiple video sources and screen sharing. Create an amazing learning experience to help your students learn the most. Enhance teaching while enjoying the flexibility of working from home. Manage effects, digital props and masks with the organization folders. Be the best game streamer you can be! 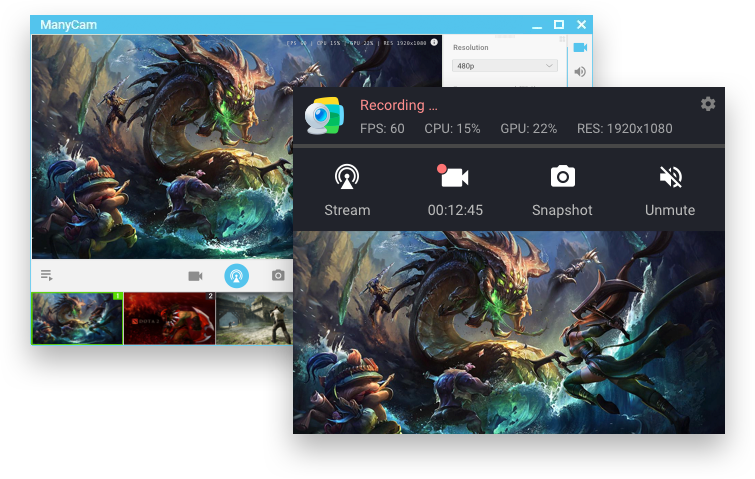 Stream or record your PC & Console games, display your webcam with any background using the Chroma Key feature and easily control your game stream with the ManyCam overlay. Create professional-looking live streams adding up to 24 different video, audio and image sources. Mixing up live video with secondary footage and other sources of media allows you to deliver a well-rounded and effective message. Get the most out of your live streaming sessions by connecting ManyCam to your favorite streaming services! Simply set up your preferred RTMP stream and quickly switch to where you want to go live. Overlay images, videos and any other supported source directly over your broadcast or share the stage on your live stream by splitting your window into multiple video sources. Just like on professional broadcasts, this feature allows you to replace your green screen background with any image, video, effect or any supported video source, so that you can appear to be anywhere. With ManyCam’s modular UI, you can move tools and group your favorites on a separate tab. Every feature is just one click away. 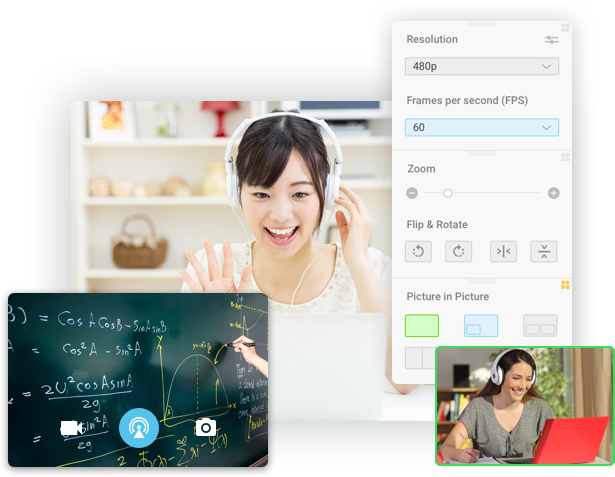 Customize the hotkeys to save time during video conferences, webinars and all your live video endeavors. Get access to our Effects Gallery with hundreds of effects, objects, overlays, and 3D Face Masks to create fun online video chats and live streams. Get creating with your video calls and add your own effects to the gallery. Broadcast to multiple channels simultaneously. Use ManyCam to live stream on multiple platforms at the same time. Change your voice and apply microphone effects to your videos and broadcasts. Highlight important information, add your name, location and observations to your broadcasts. Choose between many amazing effects or create new ones to add to your videos. Broadcast your desktop screen live or record them before hand to present demonstrations, tutorials and online courses. Display different watermarks during your broadcasts and video chats. Use ManyCam wherever you are. With the ManyCam Mobile app you can live stream from anywhere to all your favorite platforms. Or, if you don’t have a webcam, use your IOS or Android device instead to create live stream from the ManyCam desktop application. Go to whatever application or website you are using and choose ManyCam as your video and audio source. I agree to receive ManyCam newsletter containing news, updates and promotions regarding ManyCam products and activities. Learn how to use ManyCam with apps and websites you like. Read articles and watch demos to improve your experience. Provide feedback and see other help topics. Copyright © 2019 Visicom Media Inc.
Don’t have an account yet? Create one now! It takes less than a minute. If you already have an account, please log in. This beta is for users with paid subscriptions only.